Senior Weston Hatfield sings Nelly's "Hot in Here" during Low Volume's performance at Clementine Cafe. Junior Leif McCoy (center) and senior Weston Hatfield (right) perform "Superstition." Shouts and hollers filled the air of Clementine Cafe as senior Weston Hatfield and junior Kate Cummings stripped the jackets of their 80s look and threw them to the floor. The crowd was loving the cover of Nelly’s “Hot in Herre” being performed by Low Volume, a student band. It was 9:30 on a Saturday night, Jan. 5, and the servers were struggling to make their ways through the crowd of HHS students swarming the stage in the back of the restaurant. For senior Sam Schaeffer, lead percussionist, this cover was a favorite of the night. “The audience’s reaction was really great, and it’s just a really fun song to play. It features each member of the band well,” Schaeffer said. Low Volume was formed about two years ago. Though the band currently has seven members, the Clementine’s performance included an eighth, Will Evans. After performing a gig with Schaeffer and meeting senior Jaden Graham at All-State jazz this year, Evans left a lasting impression on the members of the band. “He’s absolutely incredible. He’s a way better musician than any of us. It was really sweet to get him [to perform with us],” Graham said. Evans came down for only one rehearsal before the gig, but for the other members of Low Volume, the preparation took weeks. “We practiced probably for an entire month beforehand, and we had people taking vacations for winter break, so it was just a huge logistical nightmare until the last week when we managed to finally get everything together,” Graham said. In 2018, Low Volume performed at Clementine’s when they opened for Gryzzle, a band made up of JMU students. This time, Low Volume sold out their first headlined show with an opening act from a younger HHS band, The Governeers. “It was a lot more stress and emphasis on us beforehand [than when we opened for Gryzzle]. We [had] a lot of time to cover, but the actual gig was much smoother than we thought it was going to be. We were actually cut off,” Schaeffer said. Low Volume is looking to perform again at Clementine’s, with the ultimate goal of moving on to even bigger venues and, consequently, bigger audiences. Seniors Sam Schaeffer, senior Noah Pope, junior Kate Cummings, senior Weston Hatfield, senior Jaden Graham, senior Philip Hart and junior Leif McCoy make up the Low Volume band. 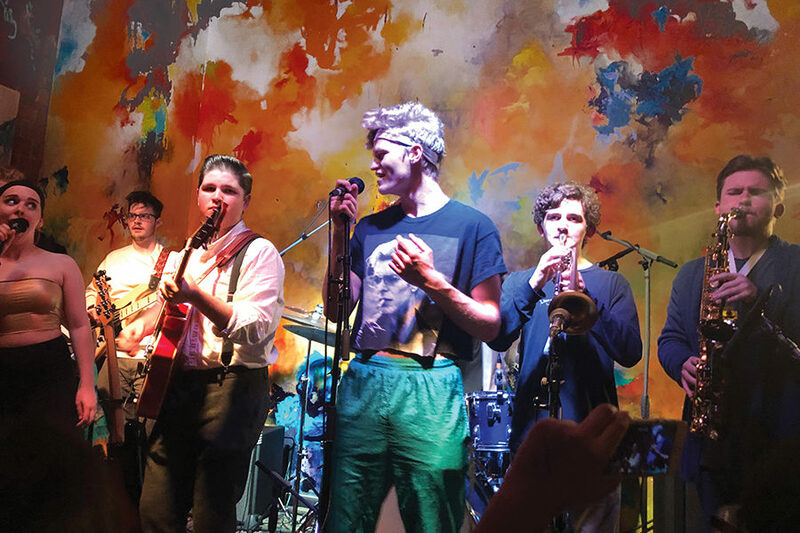 Harrisonburg High School’s Low Volume started as just friends playing music together, but it’s grown into a schoolwide phenomenon. Saturday, Jan. 5, Low Volume headlined a sold out show at Clementine Cafe, coming a long way since they first came together two years ago. According to guitarist junior Leif McCoy, the band formed naturally. When Low Volume started, they were a jazz band performing gigs for older people. Since, they have transitioned away from jazz and into funk, performing covers in addition to two original songs. 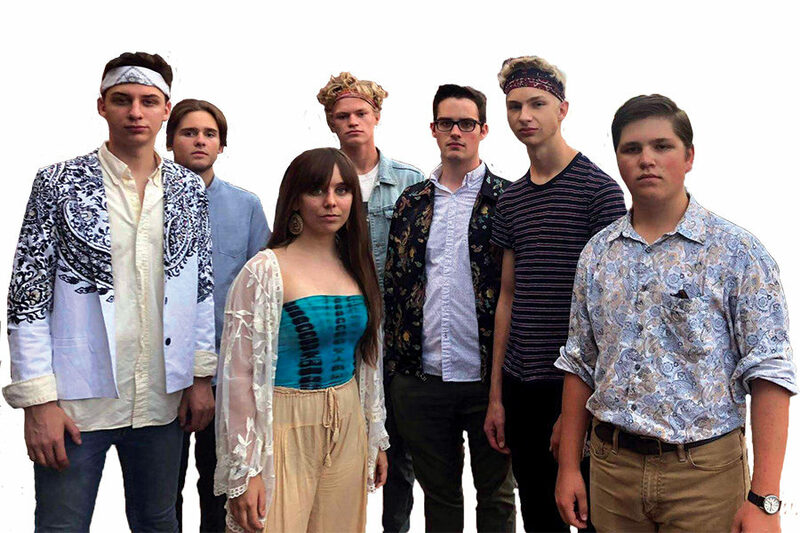 Besides McCoy, Low Volume consists of seniors Sam Schaeffer (percussion), Noah Pope (alto saxophone), Weston Hatfield (percussion/vocals), Jaden Graham (bass), Philip Hart (tenor/soprano saxophone and piano) and junior Kate Cummings (vocals). According to Hart, a major part of the transition from jazz to funk was the switch up the arrangement. 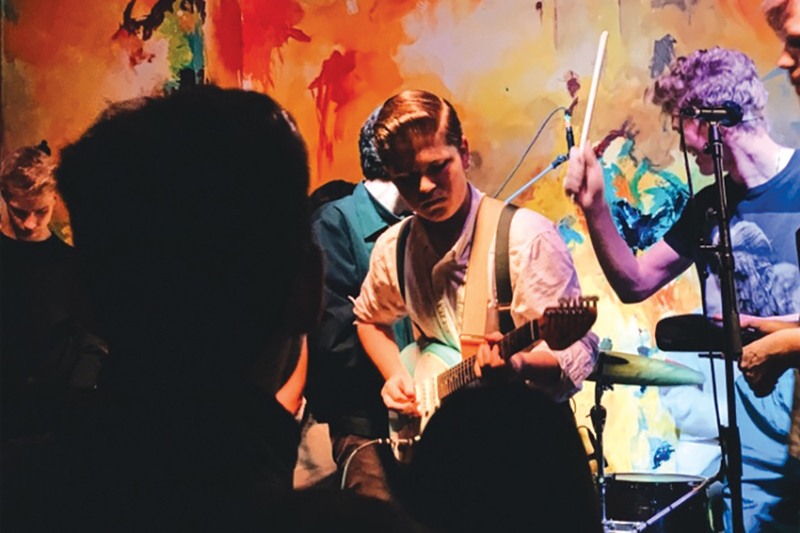 Before headlining at Clementine, Low Volume was the opening act at the same location in August 2018 for Gryzzle, a band that they also draw inspiration from. Despite having much jazz influence, Low Volume doesn’t incorporate solely jazz and funk into their music. As most of the band members are seniors, the future of the band beyond high school is unknown. Currently, Low Volume just wants to continue what they’ve started, taking advantage of the gigs and opportunities to perform.